With more than 1,400 executives, elected officials, business owners and civic leaders attending this annual luncheon, it is the largest forum for the Mayor of Philadelphia to address the region’s business community. Each year, the Mayor introduces new economic development initiatives and shares his vision for the city. 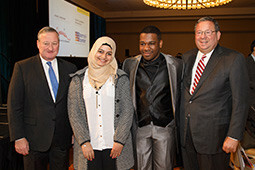 Each year, Comcast presents this $5,000 scholarship to two Philadelphia high school students planning to attend a Philadelphia college or university. The students are chosen for their outstanding leadership, academic achievement and commitment to community service.